An Ebony magazine article has given Bermuda a strong recommendation as a tourist destination, citing five of the many reasons that people should consider paying the island a visit. The list of reasons for visiting Bermuda begins with the newly-renovated Fairmont Hamilton Princess, saying, “With its recent renovations and ideal location in the central town of Hamilton, the Fairmont Hamilton Princess is the perfect place to stay for a business trip or weekend getaway. 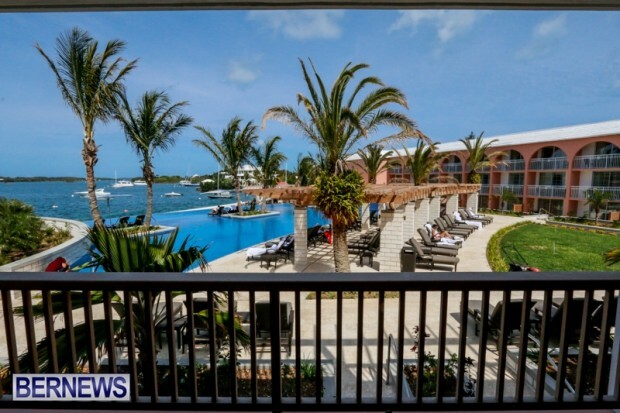 The article closes with an overview of the hospitality that Bermuda is so well-known for, saying, “I am always in awe of the general hospitality and friendliness of Bermudians whenever I visit the island. People greet strangers with “good day” no matter where you are, and being invited to a barbeque or a boat party at some point during your visit is not out of the norm. Hopefully it translates to more tourists now. One thing I have noticed is there seems to be a lot more tourists here as of now as indicated by the number of rentals on the road these days. Most people that read Ebony are Black so that means the Elite or well to do Blacks would consider which is a small % compared to de average blue color worker/Joe Blow would not be able to afford it vs down de Islands where de dollar goes further!!!!!!!!!!!!! Over 8 million African Americans travel abroad every year for Vacation. – 65% live on the eastern seaboard so lets look at this with more vigor and energy. —– by the way the color of money is green! Ebony’s audited circulation is actually 1,280,350 on average for the last six months of 2013. To lay claim to circulation of nearly 11 million per month does not speak well for its influence or credibility. Preliminary figures subject to audit as filed with the Alliance for Audited Media. You have to get Art Mel’s Ginger Bread as well – to die for! ” -to die for! “…those of you that have heard this expression know just how bloody stupid it it! lighten up sir,, figuratively speaking, we all know what is meant by the expression.. have some asthma medicine or something, you sound like a miserable person. He just ain’t tasted Art Mel’s Ginger Bread yet!!!! Excellent reply!! Touche, my friend. Taste the ginger bread!! Guess this writer has limited knowledge of slang phrases. If something is to die for, it is extremely good. Nuffin but the truth, sounds as if you do not obtain enjoyment from reading. SHUT UP YOUR PIE HOLE! This is awesome! Thanks Ebony magazine and do take note Bermuda – let’s continue to do our part in making the tourist experience an awesome one! This is great exposure for Bermuda. Clearly we have the natural beauty and friendly people. With a few improvements to our product we can attract the right number of air arrivals to boost our struggling economy. We only need 200,000 more arrivals per year which I think is achievable. Go OBA/Tourism Authority! Keep up the good work! Ummm… This free endorsement by Ebony magazine depicting Bermuda as a fun destination has absolutely nothing to do with the current government or T/A . How can you say that with Any certainty? It is quite possible the TA invited them here to write their article. It is with great relief that she was treated in a manner that made her write such nice things about us, I would like to thank her for sharing her experience in BDA. Now if we can get everyone on board with treating our guest workers and PRC residents the same, we will all be better off for that as well!!!!!!! This is absolutely great news!It’s something we’ve been seeking for years! We thank you Ebony. Ray, You know better than this. before it becomes more of a s***hole !